It’s already February. How did this happen? The holiday season is way in the rear view mirror. And what we have now is the transitional period of waiting for winter to slowly end before the festivities of Spring begin. Now that sounds negative. A transition period seems to have a negative connotation if interpreted that way. But thankfully for those of us in Maryland it’s been a bit milder than usual. What this means is instead of hibernating and disappearing which tends to happen around this time, we now have more people wanting to hang out and host beautiful dinner parties with beautiful friends, who have even more beautiful souls. I’ve been honored to attend these several of these convocations throughout my time on this earth, and lately the amount if escalating. Maybe it’s destiny, as it gives me more ideas and inspiration to share. This dinner was more of the low-key variety. To be more specific, it was a quiet one for two. I have the honor of knowing lots of great people in Baltimore, and to be invited into someone’s house is a treat I never take for granted and fully appreciate. As always, with dinner, I never come empty handed. And I don’t remember the last time I didn’t bring wine. I was told ahead of time by my friend that a chicken stir fry type of dish would be on the menu. And when it comes to that kind of specificity, I want to bring something to complement the dinner and the theme. Leave it to one of my new go-to’s at Canton Crossing Wine & Spirits to come through once again. I had done my research. A lighter wine made sense with a likely spicy stir fry dish. Pinot Noir and Beaujolais seemed like the obvious. But it’s not always about the obvious. We can’t always follow the suggested, how accurate they may be. It’s good to go with an instinct or in this instance, a little help from beyond. Let me not so be dramatic. There’s a great staff at this shoppe. And one in particular steered me to try the 2014 Mas Carlot Tradition Rouge. At only $12, I felt like I had nothing to lose and everything to win, and learn from regardless. This wine was a grower. I’ll explain shortly. I got to my friends place and literally got to experience the entire crafting of the dinner until the end. There was a slow build in the conversation which tends to be a lot of my doing, or maybe for other people too. But I like it that way. It’s a nourishing kind of discussion. I may start off a bit awkward, but after a little wine and a few appetizers, and maybe just a little more libations, my senses are calmed and heightened. The conversation grows organically as it was always destined to be. And just like our discussion is breathing and evolving, so was the wine. This whole process took on a life of its own I’m not sure how much time went by, from when this bottle was opened until completion. This medium bodied wine got better after a few sips and enough time to breathe. Some folks or experts would say it had opened up nicely. That’s exactly what happened whatever semantics you want to use. Grenache and Syrah carry most of the weight. And carries it well. And a little Mourvedre goes a long way. There were definitely some kind of spices along with those darker fruits that tend to embody wines from the Rhone Valley. I see there were notes of strawberries. How perfect that strawberries were the dessert. I know I’m skipping around the order but it needed to be mentioned. And I’m not always about proper order. It worked so well with the shrimp we had beforehand. It was going to work with everything. Enjoying yourself, the company we keep, and everything that goes with it makes just about any wine that much better. The dinner was marvelous. The simple time are always the best. I feel like this was the best wine under this circumstance. We were meant to have this in that moment. I don’t know if this a wine I will ever have again. And if that’s the case I’m fine with that. I only say that because it’s a label I’ve never seen before and wouldn’t stick out right away in most instances. For more on this wine, here is the official site which you can translate. A little for more can be found here. Once again, if it’s the only time I ever have this wine, it will be fitting. It will remind me of this enjoyable evening I had and nothing else. And nothing else needs to be said. A dear friend of mine went to Jamaica recently. And has been on their food kick, since coming back. We’re fortunate enough to have many International restaurants near us in the area. And that includes delicious foods from the land of ‘Out of Many, One People’. And what a perfect opportunity to try some new foods and of course, a bottle, to pair with these dishes! In doing my in-depth research, I found that the spicier foods (such as what we were about to eat), should be counterbalanced or complemented with some sweeter whites. We don’t want a full-bodied red or lots of oak, to detract from the food we’re enjoying. We want the our meal to be enjoyable, and we want the wine to enhance that. With a lighter selection, more flavors can come out from our dish. We also want a wine that’s low on tannins. This is nowhere near as complicated as it sounds. I am a huge fan of medium to full reds. But having one of those would completely undermine our meal and our wine. In some instances, it’s brought out the cheapness of the food and the wine. I found this site very useful in my quest. 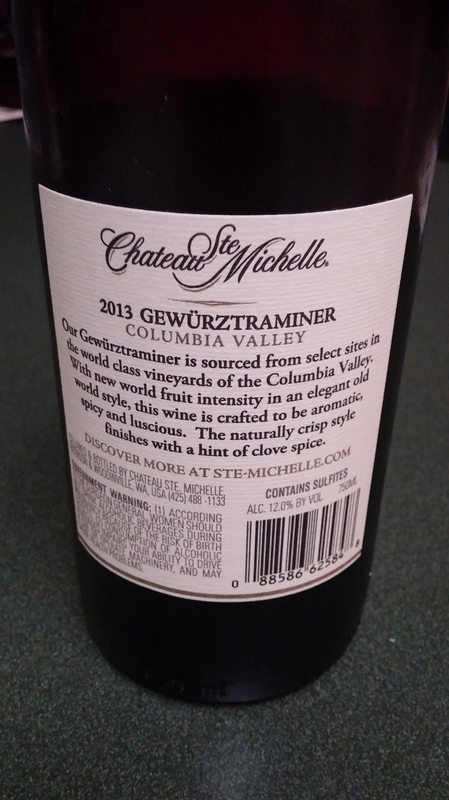 With the knowledge presented to me, I wanted to get a Gewürztraminer. It’s a wine I wish I had more of. We’ve enjoyed this grape a few times over a Thanksgiving meal. And I’m happy to the opportunity has been presented itself to enjoy once again! I want to thank Friendship Wine & Liquor of Abingdon, MD, for helping me pick out a bottle. 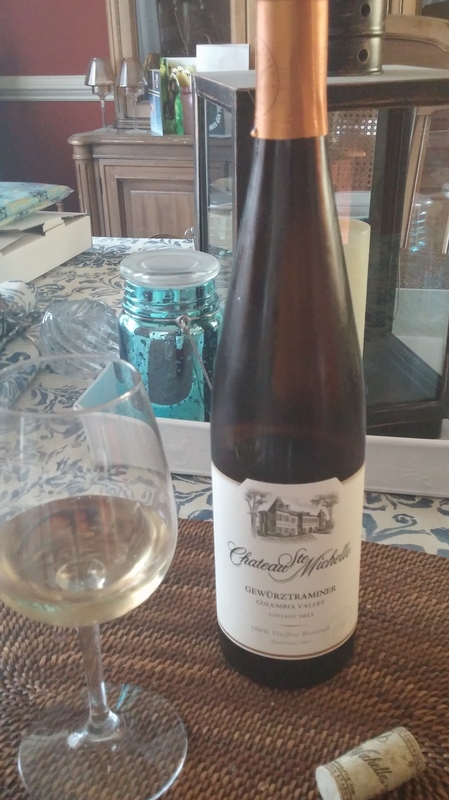 I chose the 2013 from Chateau Ste. Michelle. And this is a winner! It was very easy to drink and didn’t feel as if it were too sugary or acidity for my liking. I didn’t detect any clove spice as the synopsis says. But I could sense some fruit. Which fruits there were, I don’t know! But I was loving this choice. And and under $10, I feel this was a steal and a half! 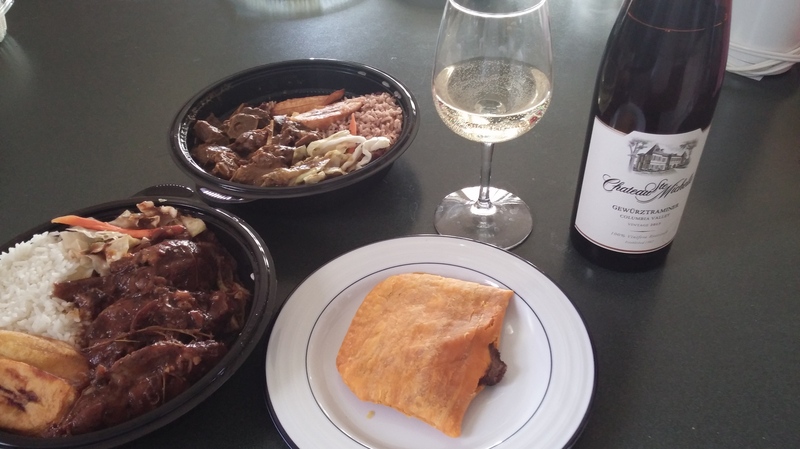 We enjoyed our bottle with a wonderful Brown Stew Chicken, Goat Curry, Plantains, and a Meat Pie. Everything about our meal, from the food to the wine, was wonderful. This can pair with many spicy foods, not just Jamaican. It’s all about personal preference. Most important of all is to try what you like. And that you are enjoying the wine and food together. And I am grateful to have been introduced to another great winery, whose wines will be seeking out on a regular basis now. That’s one of the fun parts of this! Now I have so many new ones I want to try. The winery itself looks beautiful from pictures. And it makes me want to visit them in Washington State. I suppose I will!